LAS VEGAS, Nevada — HARMAN’s BSS Audio today introduced its Soundweb Contrio family of wall controllers, designed to provide greater system control and flexibility for a variety of fixed install applications. The Soundweb Contrio wall controller lineup features four models that, in addition to advanced multiple zone control, can easily be employed in a room-combining and splitting environment. The Soundweb Contrio platform and its two initial products, the Contrio wall controller range and Contrio Server, are the first within the Soundweb Contrio family that will ultimately provide enhanced system control capability and audio routing flexibility for a variety of applications. All Soundweb Contrio products will be backward compatible with existing BSS Audio Soundweb London devices, providing the widest and most comprehensive choice of audio processing, distribution and control devices available in a single system solution today. Contrio wall controllers are powered via PoE (Power over Ethernet) and are compatible with HARMAN HiQnet™ products. 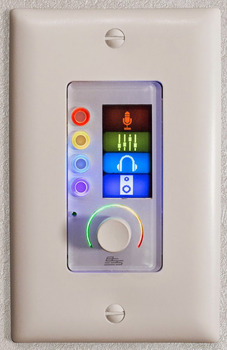 Simple controls and multi-colored visual feedback and displays make the controllers approachable and straightforward for non-technical users. Multiple modes of operation allow system integrators to tailor the functionality of the controller to the requirements of the application and its users. “The Soundweb Contrio Wall Controllers are designed to provide a simplistic, yet powerful interface that allows for greater control of audio for a variety of applications and venues. These controllers along with the other members of the Contrio family are designed to provide integrators and end-users alike with better control, management and ultimately, performance, of their audio systems,” stated Iain Gregory, Market Manager, Installed Sound at HARMAN Signal Processing. Soundweb Contrio controllers are scheduled to be available in September 2014 in white or back finish and EU or US form factors.